Copy and paste are Windows commands that allow users to copy content from a source that is then “pasted” in another window or program. The process can be done by selecting any supported content such as text or a file on the disk, right clicking to open the context menu, selecting copy from the list, moving the cursor to the next location and opening the context menu again, then selecting “paste.” It can also be handled with the hotkeys, “Ctrl+C” to copy and “Ctrl+V” to paste. File attributes are also a common issue that prevents a file from being copied, moved, or deleted. To open a specific file’s properties, right-click the file and select “properties” from the contextual menu. The file’s properties will be shown. 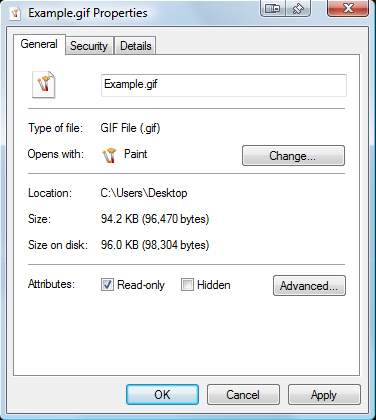 A GIF image graphic titled “Example.gif” was used for this example. Under the “Attributes” section, the “Read only” option may be selected, which prevents changes from being made to the file and file copies from being created. To remedy the problem from the attributes, deselect “Read Only” then choose “Apply” to allow the new settings. This issue may be present on external media devices with copy protection permissions as well. On SD cards for instance, the file protection is done through a small lock switch on the card itself. Make sure that external media devices do not have file protection enabled if trying to copy to and from them. Some external media such as removable hard drives or flash thumb drives may have additional software that prevent copying or changing files on the media. The user must disable the settings or exit the software to enable copy and paste to and from these sources. Alternatively, use the search function in Windows Vista or 7 to type in “CMD” and wait for the command prompt to be listed or simply press enter to run it once it is found on the system. It can also be opened with the run command by holding down the “Windows” button, pressing the “R” button, typing “CMD” into the text field, and clicking “OK” to run the program. The last alternative is to go into the hard disk file system and find the command prompt program by opening the local installation drive for Windows (usually drive “C:”) and navigating through the “Windows” folder then the “System32” folder where the file “CMD.exe” is located. Copy and paste the following into the window’s location bar: “C:\windows\system32\cmd.exe” to open the file from the exact location. Once the command prompt is open, type in SFC/scannow, then press enter to run the command. A message that states, “Beginning system scan. This process will take some time.” will appear with a verification system scan. This will search for missing or corrupted files on the system that should be replaced. Once the scan is finished, the user will be notified of errors on the system, whether or not they have been repaired, or if additional steps are required to repair the system. If a problem was found and the system files have been restored, it is important to restart the computer in order to register the system files so that the system can use them. This process may clear up the issue of being unable to copy and paste as well as additional issues that may have been observed in the past. One issue with Microsoft Internet Explorer may actually prevent users from accessing the copy and paste functions. It deals with particular Microsoft Internet Explorer settings. To check to see if Microsoft Internet Explorer is causing the issue, it is important to explore the settings window and make any necessary changes. Click on the “Tools” tab and choose the “Options” item in the list. This will bring up the options window. Choose the “Security” tab and choose “custom level.” An option listed in the various settings possibilities is “Drag and Drop” or “Copy and Paste.” Ensure that the “Enable” box is checked for each option to allow Copy and Paste functionality for Internet Explorer and in some cases, throughout Windows. Sometimes a virus or malware problem prevents functions such as copy and paste from working correctly in Windows to make it difficult to resolve the virus issue as well as render the system less usable. In order to correct the issue it is important to run a full system scan for virus or malware and or spyware. Find detailed directions to remove a virus on Tech-Faq: How to Remove a Virus. The user may have inadvertently removed conventional copy and paste functionality on their computer by installing third party software. One of the most common culprits is Tera Copy, which makes changes to the system in order to change how files are accessed on the system. There are other third party software that may also be responsible. So taking the time to fix the settings on the software to allow normal copy and paste functionality may be required. The final option for third party software is to remove it from the system. Review the software uninstall instructions and follow them through. Not properly removing a third party software from the system risks having problems with the system . Some third party software require several steps to successfully remove the software from the system. You can use “Long Path Tool” ! 325 queries in 0.361 seconds.